I must be getting old, since I don’t seem to understand the growing trend of tattoos everywhere. It used to be that a military man might get an eagle tattoo on the bicep or some other simple piece of art. But times are changing. Nowadays, customers are getting much larger tattoos and in places you can’t talk about in public. Go to your local swimming pool and in moments, you can spot them all over the place. And then there are the piercings. Piercings? Really? 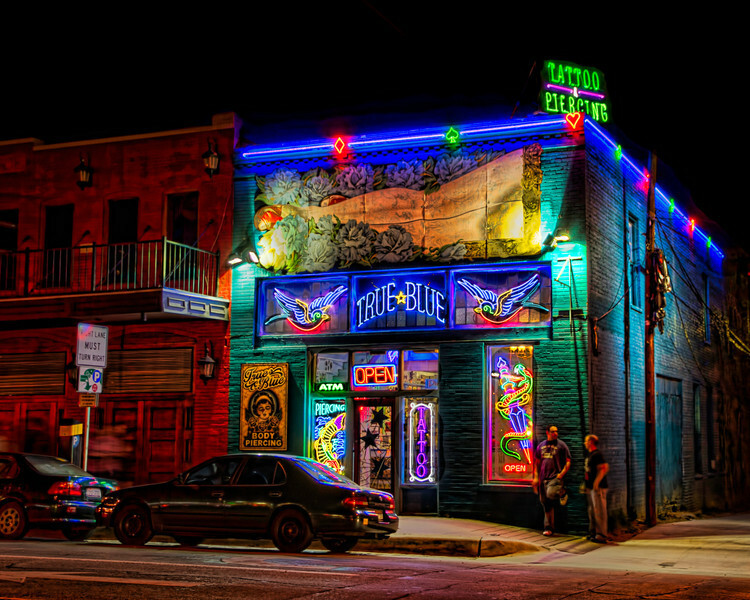 This colorful establishment can be found in downtown Austin, in case you were wanting some new body art too. What a fabulous shot, Tim! LOVE the colors and tones! Not to mention all the wonderful details that are hidden here for the viewer to discover as they spend time taking it all in! Thanks Toad. You never know what you’ll find wondering the streets of Austin.